Gender issues have come into the international limelight and have been debated on their adverse effects on maternal health care utilization. As long as artificial social cultural barriers prevent the full and equitable involvement of both sexes in creating and enjoying the benefits that society offers, individuals will not be able to realise their potential for health and well-being. 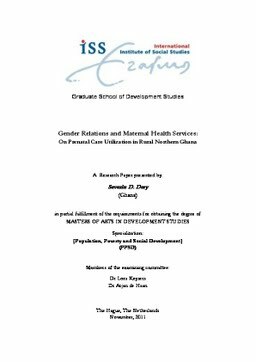 This study attempts to unravel how women in rural northern Ghana straddle the gap between patriarchy and health necessity; and how that has ripple impacts on the health of women. Data from the GDHS 2008 are examined in this research and highlight the constraints of education, religion and place of residence on the use of prenatal care. The measures taken to curtail these adverse consequences on women‟s access and use of prenatal care services are discussed.